The Bacon Explosion — Two pounds of pork sausage wrapped in two pounds of bacon. Let’s just all agree that Megan Miller Day is likely the biggest celebrity in Lee’s Summit right now, shall we? The Pitmaster (a rarity for a female) has won Chopped, been on the Today Show, has another appearance on The Food Network upcoming and is part of enormous marketing success that is the mammoth, meaty Bacon Explosion phenomenon. Oh, and she just took second place in ribs at the prestigious Memphis in May competition with her husband and Burnt Finger BBQ partner-in-crime, Jason Day. From grilling at the Super Bowl to Good Morning America and the New York Times, Megan and Jason Day have made a living out of something most of us are only marginally proficient at – grilling. From the beginning ranks of grilling beginners in 2008 to today’s astronomical competition and Bacon Explosion successes, the Lee’s Summit couple has certainly been at the forefront of honors for their skills, and Megan, recently, the face of the team that invented a dish that wrapped two pounds of pork sausage with two pounds of bacon, AKA, the Bacon Explosion. Prior to the birth of that beefy (errr, porky) brainchild, however, Jason and Megan were newlyweds with an itch to start grilling competitively. They would soon find out just how talented Jason was. The couple waited until after the wedding to get started. In fact, it was the week they returned from the honeymoon when he informed Megan they were competing that weekend in a barbecue competition in Mission, Kan. They finished in the top 20 right off the bat. “We knew this was going to be more than just a hobby,” Megan said, recalling that the Burnt Finger BBQ team then suggested to take on the American Royal next. As divine intervention would dictate, a team dropped out and Burnt Finger got in – taking fifth in brisket and 38th overall. “Now, we thought, this is really going to be expensive,” Megan laughed. Soon after, a political pundit, Megan recalls, said on national television a Congressional bill “had more pork than the Bacon Explosion,” also sharing the recipe on his blog. Cue visits to Good Morning America and Fox & Friends the Wednesday prior to the Super Bowl – which quickly accelerated to flying the couple to Tampa Bay to make the Bacon Explosion live at the big game. Megan had to step up her role and become Jason’s Pitmaster in 2012. With appearance requests rolling in and competitions still around each corner, she decided to leave her job at Children’s Mercy Hospital to fully tackle the new ventures, including getting the Bacon Explosion into more commercial venues. Two years ago, the minor league Iowa Cubs in Des Moines started serving Bacon Explosion at their stadium. Then World Market called last summer, and quickly sold out. Of course, consumers don’t have to drive to Iowa to find the porky goodness. Locally, you can purchase a fully cooked (frozen) one at McGonigle’s in Kansas City or Meiners Market on Missouri 150 in Lee’s Summit. 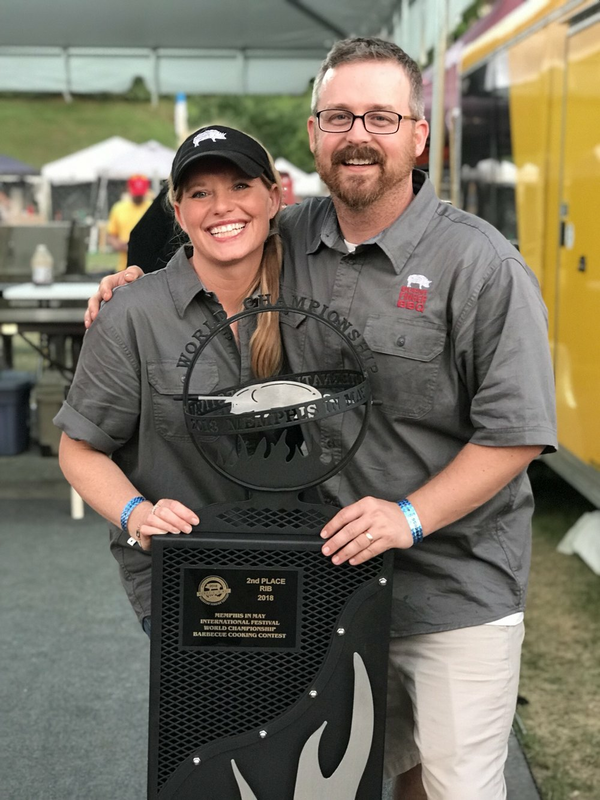 Megan and Jason Day nabbed second place in ribs at the prestigious Memphis in May International Festival World Championship Barbecue Cooking Contest. If the perfect scores at the American Royal or wild success of the Bacon Explosion were not enough, the two just returned from Memphis, a “bucket list” contest, with a second-place finish in ribs and third place overall. Coming off her win on the fourth season of Food Network’s Chopped Grill Masters and The Today Show appearance a few weeks later, it was becoming apparent that Megan’s mug was starting to be quite noticeable. Megan and Jason have more spotlight ahead, appearing at 10 a.m. June 9 on Food Network’s The Kitchen, where the duo will create a Bacon Explosion slider, side and cocktail. Fans can watch that show with Megan and Jason on hand June 9 at Stuey McBrew’s, 321 SE Main St., during its air time and enjoy the same creations featured on the show that morning all for a $12 ticket. Don’t miss this event (link below). Or, if you do, at the very least, order up one of those Bacon Explosions. Your heart (and the Days) will thank you.